Rose Tico is going to be so jealous. John Boyega, star of the recent sequel Pacific Rim Uprising, has suggested that Rey and Finn will be together again for Star Wars 9. The pair reunited at the end of The Last Jedi. And now Boyega, appearing at a convention, hinted to the crowd that these two won't be separated this time around. The Last Jedi found Finn awakening from his coma while Rey was off on Ahch-To with Luke Skywalker hoping to learn the ways of the Jedi. 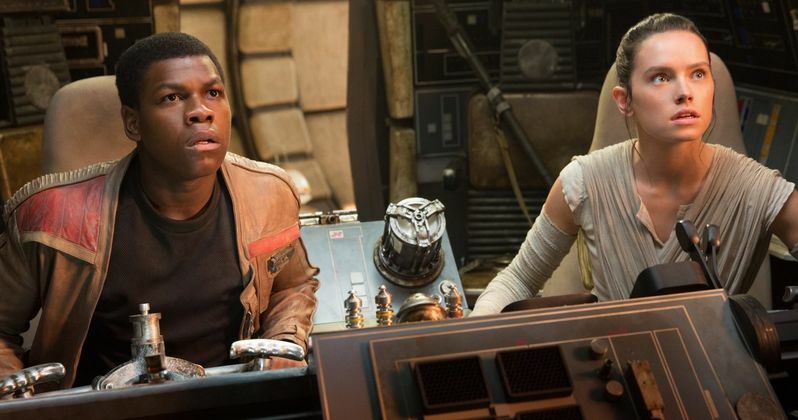 Much to some fans' chagrin, Finn was joined on a separate message to infiltrate a Star Destroyer with franchise newcomer Rose Tico. And it wasn't until the very end of the movie that Rey and Finn got to hang out once again. This closely mirrored what happened with the main cast of characters in The Empire Strikes Back, which separated Luke from Han and Leia as he went about his training on Dagobah. John Boyega appeared at Awesome Con this past week, where he was able to provide the briefest of updates on the latest Star Wars sequel. The actor has made it clear during his Pacific Rim 2 press run that he has yet to read the script, which J.J. Abrams finished a few weeks ago. But the actor claims he received a text from Daisy Ridley and it contained some surprising news. Star Wars 9 will begin shooting this summer under the directorial eye of J.J. Abrams, who returns to finish what he started with The Force Awakens. As with all Star Wars movies, no plot details have been revealed at this time. And we have to carefully consider what Boyega is saying here. While it appears that Rey and Finn will be together again, Daisy could have just been super excited that both actors were heading to Pinewood Studios together. The duo will surely be together at the start of the sequel. When we last saw them Chewbacca was co-piloting the last of the Resistance away from Crait with the First Order in hot pursuit. Most believe Star Wars 9 will begin with a massive time jump, to answer for Carrie Fisher's real life death when it comes to dealing with Leia, who was left very much alive at the end of the previous sequel. There have been murmurs that Fisher could be replaced by another actor, such as Meryl Streep, but we think that's just Internet babble and won't actually happen. It makes sense that Star Wars 9 would bring these two together, as it's the final chapter in this story. It also brings up some interesting complications for Rose, who is clearly pining for Finn. Rey won't stand in the way of that as she sets out to finish her Jedi training. It will definitely be interesting to watch this all unfold and see where J.J. Abrams takes the end of this particular series as Lucasfilm focuses on two more new trilogies that are already confirmed to split away from the Skywalker saga permanently. This news comes from SWNN's The Resistance Broadcast.